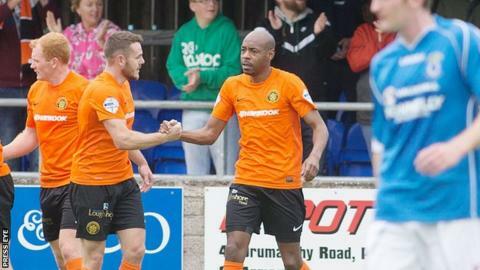 Carrick Rangers host fellow strugglers Dungannon Swifts in a rearranged Irish Premiership game on Tuesday night. Carrick threw away a two-goal lead to lose 3-2 to 10-man Portadown on Saturday and are chasing their first league win since 12 September. The Swifts are on a worse run of form, having lost seven league games in a row, the last five by a single goal. Carrick lie 10th in the table on 11 points, with Dungannon three points worse off in 11th place. The Stangmore Park club last picked up a point in a 3-3 draw with Portadown on 19 September. Five weeks later Rodney McAree took over the reins as manager after Darren Murphy resigned following a defeat by Ballymena United. The Swifts conceded a late goal to lose 2-1 at home to Glenavon on Saturday. "When you come off a defeat like we suffered, the first thing you look for is your next game, to try to make amends," said McAree. The fixture was scheduled to be played on Saturday 7 November but was called off because of a waterlogged pitch.